Since 1982, Texas MedClinic has been providing Urgent Care, Occupational Medicine, Sports Medicine and Travel Medicine to the cities of San Antonio, Austin and New Braunfels. 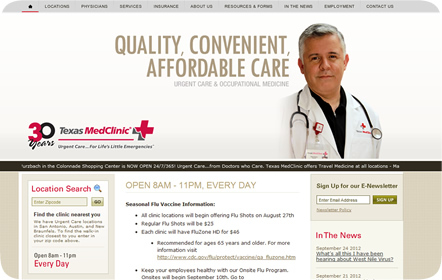 Texas MedClinic is here to help all its patients at an affordable price every day, with a 24/7/365 clinic located in the Colonnade Shopping Center. 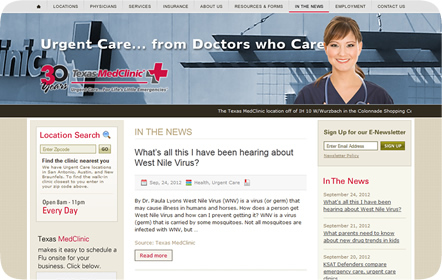 They strive to be the absolute best medical provider and to be the first choice for its community. 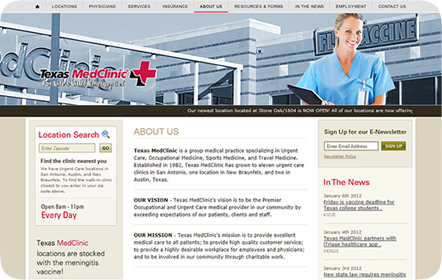 The medical market is constantly growing and evolving, and Texas MedClinic didn’t want to be left behind. They returned to us to update the first website we made to further establish their brand both offline with various print pieces and online through the website. 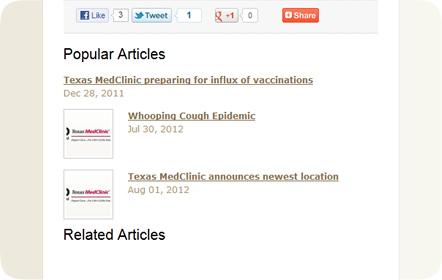 With the importance of social media on the rise, we made sure to include all the possible ways to connect with Texas MedClinic in the website’s dynamic footer. 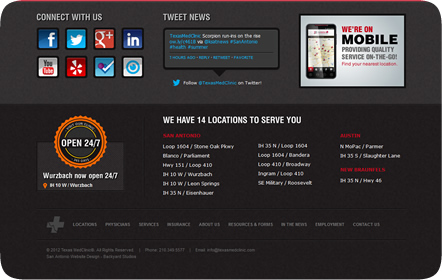 You can find the latest tweet, their Facebook fan page, even their YouTube channel all in one convenient place. 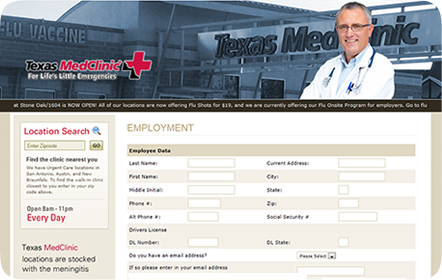 For those more interested in working at Texas MedClinic, we made a custom application form in the employment area. We also added a custom back-end so the maintainers can quickly and efficiently update the website with the latest news and information. 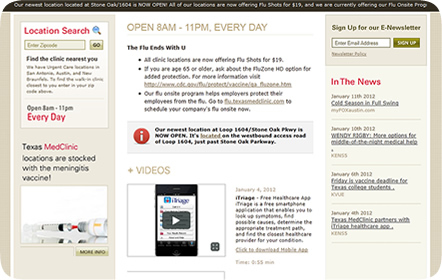 They were so pleased with the execution of this new website they returned to us later on to construct their mobile site.